First off, I feel the need to apologise for my last post – kudos to anyone who tried to struggle through it. It’s hard enough to decipher the problems someone else might be having with a pattern, but I was additionally hampered in explaining things by a lack of formatting: Our PC at home has died – and work wouldn’t let me access – so I couldn’t view the post in anything other than my iPhone. Particular thanks to those who offered help. In fact, my post was my way of establishing that the only logical approach was to accept that there’s an error in the instructions. I’ve flagged this to the designer and she referred me to errata for the pattern. Unfortunately, they don’t amend the instructions I had the problem with – which means if the designer tried to read my last post she struggled to make sense of it too. Anyway, the pieces are now joined and the edging is advancing. It’s slow going but mainly because I keep stopping to admire my work! More recently I mentioned that I had solved it without ripping and promised to let you know how. I’m pretty confident you can’t tell which one of these two pineapples is the fixed one. At a push you’d probably guess the one on the right, and you’d be right! 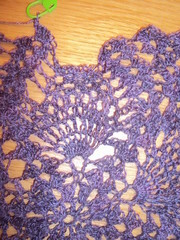 As it turned out, this pineapple is positioned in the centre of the lower-back of the wrap so will be even more hidden. Want to know how? 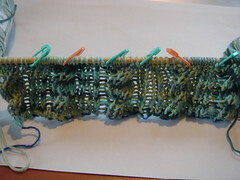 On the wrong side, I joined a separate length of yarn with a few slip-stitches along an existing chain (thicker chain 4th down from top of picture). 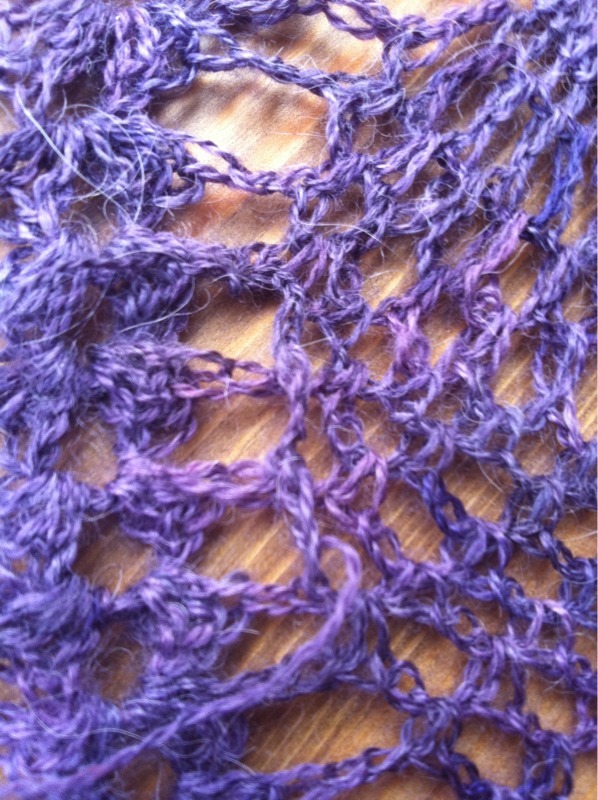 Then I made some chain stitches and joined them at appropriate intervals to the relevant horizontal chain. I did all this on the wrong-side and it’s not at obvious from the right-side. Well, for a man on a galloping-horse, anyway. 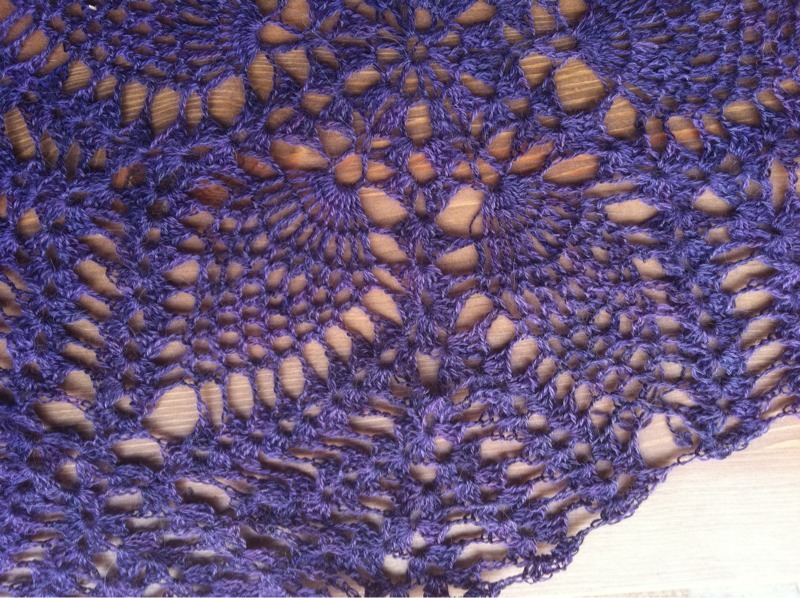 My WIP of choice this days is Petals – Kirstin Omdahl’s pattern for Crochet So Fine – that I’m making in sumptuous purple Alpaca Lace dyed by Dublin Dye Company. I hadn’t been making much headway on this at all over the past few months. For a while it was the WIP I brought with me to work because it’s so neat and portable but it meant I might only have a 15 – 30 mins to work on it at lunchtime. 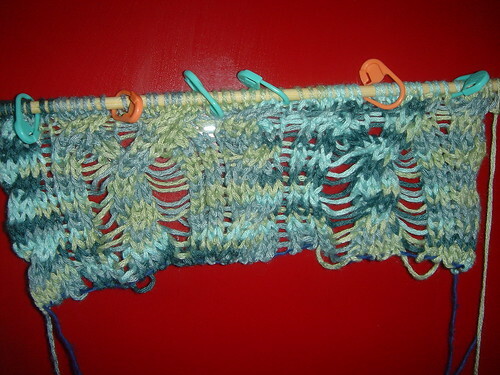 The problem was I would spend almost all the time I had available figuring where I was in the pattern, and where the beginning of the row was. Only recently did I follow through on my brain-wave of putting a stitch-marker in the start of the round. This has made a world of difference to how quickly I can get moving again when I pick it up; and how much it can progress anytime I touch it. Round-on-round I keep surprising myself at how fast it’s growing now after stagnating for so long. The green stitch-marker is holding the loop of my live stitch and I’m working anti-clockwise. The “pineapple”, in the section I have *just* made (i.e. to the right of the green stitch-marker), has a missed stitch about five rounds down. Compare it to the shape of the preceeding “pineapple” section – i.e. on it’s right. 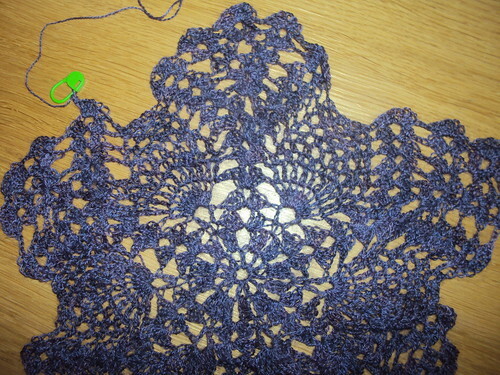 The *problem* with crochet is that – unlike knitting – there is no way (that I’m aware of) to tink down a few rows to sort out a mucked-up stitch. The choice is to rip aaaaaaall the way back to the mistake orrrrr decide you’re happy to live with it. 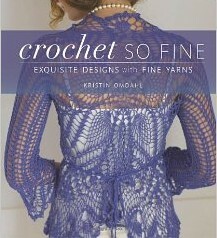 When you look at the finished garment – as it’s shown on the front cover of the book – you’ll see the bottom-most segment of the hexagon gets quite gathered. It’s likely that if I organise to position the “wrong” segment here that no-one will ever notice. However – and this is the crux of all matters of WIPping or Ripping – *I* will notice. And I think it’ll bother me. I think I’ll have to rip right back. Just as well I had figured out a way to get it to progress more quickly, eh? 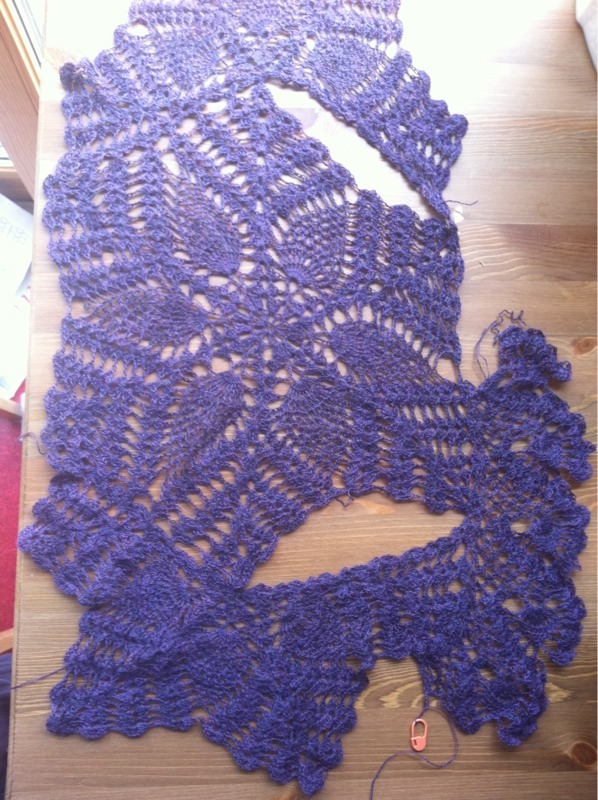 Design and knit a cardigan for DD with variagated-blue Lamb’s Pride bought in TIK last WWKIP! I also should have listed “learn how to darn”. I’ve put at least four pairs of socks out of circulation until I figure this out. If I don’t do something soon I might as well adopt The Yarn Harlot’s method: Shout “Darn!” and promptly throw them in the bin. 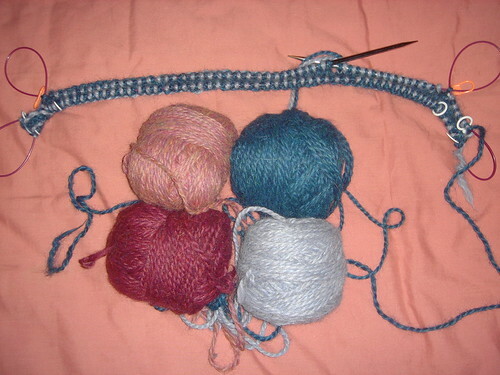 What hasn’t even made it to the list is “making progress on the Fair-Isle Ouroborus Cardigan“. Hmmmm… is that telling, I wonder? I’ve tomorrow off. I’d like to finally sort out my weekly meal planners / grocery shopping list so I can get back into grocery shopping regularly. Recently, we’ve been doing it in an ad hoc manner and I never know what there is in the fridge. So now I’ve said it – publicly and openly. You are all now not only my witnesses – you are my accomplices! It’s up to you to keep me honest. Thanks to my WIP-Busting I’m quite the one-wip-wonder these days. Doesn’t monogamy helps things grow? I have very few UFOs loitering about making a nuisance of themselves. Or maybe I’ve hidden them so well they don’t register on my conscious mind. When we were at the I Knit shop during our trip last Feburary I discovered Debbie New and her mind-blowing book Unexpected Knitting. I hatched a plan with one of my Knitting-Knight buddies to return to London in September for the I Knit Weekender. I didn’t really care who or what else was also going to be at the show. That I was going to hear this woman speak about her knitting and her inspiration; and see her work “in the flesh”; was draw enough for me. I signed up for her work-shop on Ouroborus Knitting. I take my knitting with acid! As it turned out, Alice Starmore was also there that weekend and I signed up for her work-shop on Fair Isle… and bought her book… and got her to sign my design notebook… and watched, with baited breath, as she cut a huge, long steek in a beautiful Fair Isle lap blanket she’d knit as a tube. Oh the heady-heights we reached that weekend!!! 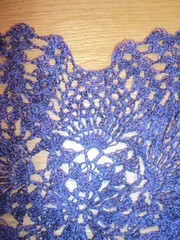 You’re looking at the “seam” accross the back – from underarm to underarm; which I cast on using Judy’s Magic Cast On. I increase at the white markers and decrease at the orange markers. (I’ve just realised that I mounted it upside-down for the photograph. This is why I need markers that expressly say “inc” and “dec”, see?) Thusly a jacket will grow as an elongated circle (more a lozenge shape, really) down my back, up over my sholders and around my arms. Trust me. Now that I’ve “come down” I’m wracked with doubts. I know there are errors. I know it’s a learning piece. I know the errors will be part of the character of the finished piece. Right? Or do I rip it now and only cast-on again when I’m completely sober; when I’ve only been exposed to “sensible” knitting, like stocking-stitch tube socks? …to the Frog Pond?- and quickly too, you Fug! 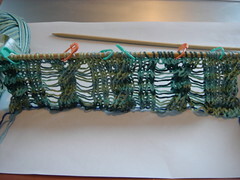 Yes, the pattern is tough but fascinating and therefore I found it worthwhile to try it. 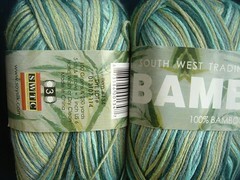 not in this yarn / colourway due to unfortunate pooling / striping that would better suit Harry Potter.